Why Feed Organic to Horses? Do Our Equine Companions Benefit From Organic Feed? While most folks associate "organic" with food items for human consumption, it is a fact that eating "organic" has many benefits to any organism, including beneficial soil bacteria, plants and animals as well as humans – and horses. Organic farming started out as a proactive method of farming that strove to rebuild the highly mineralized, high in organic matter, biologically active soils that our forefathers farmed before the advent of the NPK system and the resulting rescue chemical now used to sustain our environmentally flawed conventional agriculture. Now-a-days, "organic" as defined by government regulations seems to be focused on what it does not contain as much as what it does contain. It is good to exclude toxins but perhaps more important is to make sure the soil is highly fertile and high in organic matter. So-called "organic" crops grown on soil of marginal fertility may be free of toxins but lacking in nutrient density and mineral balance. 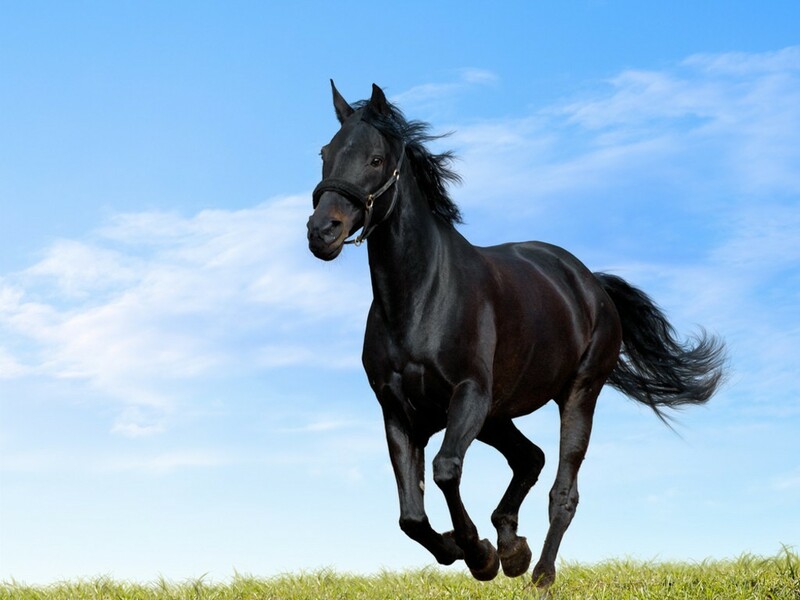 It is a big plus to feed horses organically grown feeds that do not contain toxic residues. Even though the adverse effects of these toxins have been known for many years, it is only recently that the concern has been applied to species other than humans and food producing animals. Much of this awareness seems to have stemmed from the surfacing of problems associated with the relative saturation of our cropland with Monsanto’s glyphosate herbicide. While glyphosate is generally only applied to corn and soybeans, a carryover effect occurs. Crops not treated with glyphosate but grown in contaminated fields can still harbor the chelation effects that interfere with mineral metabolism and reduce nutritional value. There is much evidence that glyphosate contamination of feeds can cause lowered disease resistance, neurological effects, reproductive failures, lowered growth and production, mycotoxins in the feed and more allergic reactions. Glyphosate is a powerful chelator and its main effect is to tie up minerals and make them less digestible. The use of Glyphosate crops not only damages the health of plants and soil microbes but also results in feed crops that are toxic as well as nutritionally deficient. The lower mineral nutrient content of feeds and forage from a glyphosate-intense weed management program can generally be compensated for through mineral supplementation…but the toxic effects still remain. Avoiding toxins is only part of the story. An equal or greater benefit of feeding organic feeds to horses is the superior nutritional quality of organic products. Organic feeds are higher in protein and the protein is more digestible. The natural vitamins contained are more readily absorbed and the minerals are naturally chelated for better utilization. All nutritional components score higher in organic feeds than in conventional. Unfortunately modern husbandry dictates that horses, like all our domestic animals, are subject to varying degrees of confinement. Then too, even organic soils and plants are not perfect and rations still may require some level of mineral supplementation. Horses, like most herbivores, have an intrinsic nutritional wisdom that allows them to balance their individual mineral and nutritional needs when given a choice. The savvy horse owner will provide his animals with a variety of separate minerals and trace minerals, free choice or cafeteria style. Bottom Line: Horses benefit tremendously from organic feeds. The slight increase in cost is offset by the less expense for vet bills, hoof care and other items. • Overall health improves and immune response is greater. • Animals are more energetic but calmer. • Weight and performance is maintained with less total feed. • Less minerals are consumed. Advanced Biological Concepts now has all Organic or non-GMO Products for Horses. We also have our own Jim's Organic Grain for Horses!